First of all, these two packages we discovered over at the AT&T online packages page, are online only. Don’t go running out to your local AT&T store to try and get the same package deals, because they probably won’t even have the package(s) available. 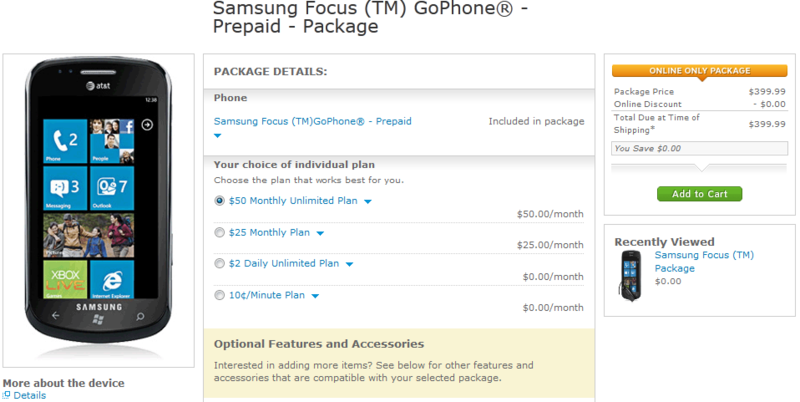 With that said, AT&T now has two great packages available with the Samsung Focus Windows Phone. 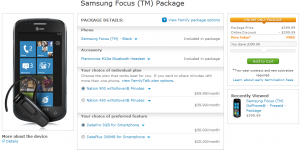 The Samsung Focus Package is absolutely FREE and comes with a Samsung Focus Windows Phone, Plantronics M20a Bluetooth headset, choice of plan starting at $39.99/month, and choice of service starting at $20/month. This is a great deal for anyone interested in a Windows Phone, and you get a Bluetooth headset that’s also free while you’re at it. Two-year contract and new activation required. The second package is for anyone that needs a quick phone with a plan, and prefers the Windows Phone OS. 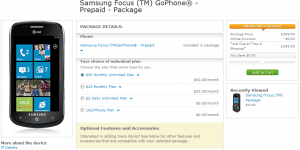 The Samsung Focus GoPhone – Prepaid – Packageincludes a Samsung Focus GoPhone – Prepaid Windows Phone and GoPhone plans ranging from 10¢/Minute all the way up to a $50/month unlimited plan. Total due at time of shipping is $399.99. These two packages are really great to be offered by AT&T. The Samsung Focus Windows Phone was the top selling Windows Phone within the first year or so from the initial launch of the Windows Phone. It’s a great device and I personally still use it as my daily, and only, mobile phone. The Samsung Focus Windows Phone has a 5MP rear camera with 720p HD video support, up to 6.6 hours talk time, weighs 4.07 ounces, 8 GB of internal storage with up to 32 GB expandable, has 3G+ support, and an amazing 4″ Super-AMOLED 480×800 WVGA display. What version of the OS do they have? If they are shipping with 8107 on board, then they’re going to have a lot of explaining to do.